This version of Altaïr was part of NECA’s Player Select line from late 2008 and is made in a 7-inch scale. 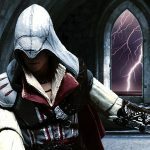 It depicts the player character from the first Assassin’s Creed game, developed by Ubi Soft. 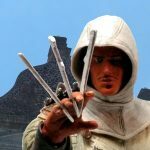 NECA made this action figure in 2010 as part of their Player Select line, and it portrays Ezio at a rather early stage in his career as an assassin, running around and jumping rooftops in the Italian City States. This figure of Ezio Auditore was released by NECA as a San Diego Comic Con Exclusive in 2012, but it was also available in 2013 from Blockbuster and Game Planet stores in Mexico City. Ezio Auditore The Mentor, wears clothing very similar to the garments he used in the Italian City States, and NECA did a really good job in capturing in plastic the look of the digital models. Today’s review will be about the main character in the Assassin’s Creed series of games, none other than Ezio, Auditore Da Firenze in his Legendary Assassin garb. The latest figure I picked up from NECA’s 1/18 scale Gears of War line is none other than the main hero, Marcus Fenix. Apparently he already was a recognized war hero even before the Locust War broke out, but again, just by looking at the figure you can tell he is supposed to be a tough-as-nails warrior. The second figure I picked up from the 1/18 Gears of War line by NECA is Damon Baird. Again, not having played the game, all I know about the character is what it says in the back of the card, which is actually very little besides of him being a quick thinker, somewhat of a tactical and mechanical genius, as well as having insubordination issues. I was not camping at the bit back when NECA announced that they were going to produce action figures in the 1:18 scale for the Gears of War videogame. They already had a fairly successful run producing larger 8-inch scale figures for that same license, so I failed to see the reasoning behind the scale change.